Next month, I'll be going with GoLive Travel to sunny Florida for the Miami Music Week with the Ultra Music Festival as the main event, I've written about UMF before, but I wanted to share some of my expectations to this epic all week EDM event. Even though the UMF lineup features super star names like Tiesto, David Guetta, Miike Snow, Justice and Fatboy Slim, it's actually some of the many other "smaller" names I look forward to the most, names like Zedd, Hard Rock Sofa and Alvin Risk. There's literally hundreds of parties, festivals, concerts, showcases, workshops, rooftop, poolside and yacht raves and unfortunately, I can't be at them all at the same time, so my travel partner and I, have tried to schedule our way through the Miami party jungle, guided by our taste in music. Below you'll find a musical walk through of our overall schedule during Miami Music Week. Admitted, this is also just an excuse to showcase some of the many greats tracks from different genres, that is out right now and present you for some artists that you might not know yet. Axwell, from Swedish House Mafia, and his label Axtone hosts a showcase with some of the other artists on the label, like Thomas Gold, No_ID and Jacques Lu Cont at the huge nightclub Amnesia Miami. We'll be going directly from the airport to this party so it'll be our first night in Miami. What a start to the 5-day long party! I guess Axwell has been pretty busy with SHM, but he's managed to do some utterly great remixes lately though, like the remix of "Resurrection" by Michael Calfan and the track below, currently topping the Beatport top 10). UMF kicks of with it's epic line up. Besides Tiësto, Kraftwerk, Skrillex and Miike Snow, great names like Kaskade, Benny Benassi, Afrojack, Tommy Trash, Wolfgang Gartner, Porter Robinson, Dada Life, Alvin Risk, Dirty South, Nicky Romero and Camo & Krooked to name a few, will also perform and I have to see them all. When the first day of the Ultra Festival closes around midnight, we plan to attend the H50 Rooftop Pool Party on the top of Viceroy Hotel featuring legendary DJ Paul Oakenfold, Lazy Rich, Alex Kenji and a couple of handfuls of other DJ's. Partying poolside on the 50th floor roof when the sun sets, with outstanding view over the Miami Bay, should be fun. This second day of the UMF holds several great European house artists like two of my electro favorites Mord Fustang from Estonia and Zedd from Germany, Hardwell from the Netherlands as well as UK (based) dubstep artists like Flux Pavilion and Doctor P, Skream and Benga, Pendulum (playing a DJ set, not from but based in UK). I also hope to catch Northamericans Datsik (Canada), Zeds Dead (Canada), 12th planet (LA), Dillon Francis (LA) and the Swedish electronica band Little Dragon. What could be better for closing the UMF and the MMW than a live performance from my favorite band Knife Party (2/3 of Pendulum btw)? In my mind, they are the ones I look forward to the most, but this last day of the festival will also include performances from Magnetic Man (UK), Lazy Rich (Canada), Hard Rock Sofa (Russia) and SBTRKT (UK), the so-called "post-step" band. 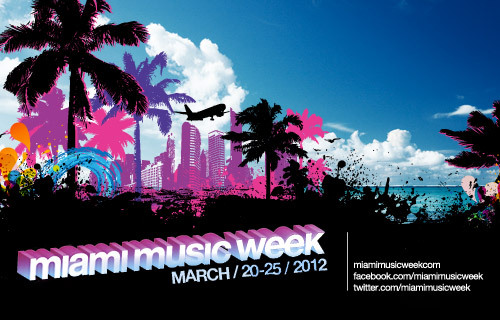 This is going to be a week packed with music and partying like nothing I have ever experienced before. I guess a couple of days at the Hyatt in Key West afterwards will do me well.